I bought a new bike last week. 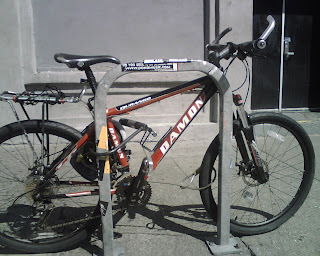 My previous bike, I'd been nursing along since 1993, finally gave me sound enough reason to pull the plug: I cranked hard to avoid an oncoming bus, on my way across town for an appointment; I felt a jolt and heard the clank of metal on the street. I looped around, up a driveway, onto the sidewalk, and rode back to the source of the sound: a chunk of cog, with about 3 teeth in it, lay on the road! Strangely, this did not stop the bike from operating normally. I carried on, and rode all the way up to the top of Russian Hill, where I'd never actually been before, to meet my clients. 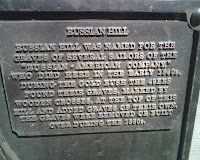 Afterward, I saw this plaque about graves, for which the hill is named: "[T]he graves were removed or built over"... Or? Like... we just don't know? This reminds me of a film by one of Deb's friends, Trina Lopez, Second Final Rest, about the removal of all of San Francisco's cemeteries in the aftermath of the 1906 earthquake, raising questions about just how thorough said removal was. I haven't actually seen the movie yet, but it's playing this coming Wednesday, at the public library main branch. So, maybe I'll go. I've put the slicks back on, now, and I prob'ly won't bomb much single-track any more, it's true--but I like seeing the visual explanation, in that video up top, for why my hands get so numb after racing down a mile or so of that stuff. Also, it's really nice, after such a long time, to have gears and shifters that are indexed properly, and brakes that don't squeak because I put the shoes on crooked--in short, to have a new bike. It'll also be nice to take advantage of the 2 years included service that comes with it. Thanks, Sports Basement! I've already customized it, with my name, and assorted accessories ripped off my old bike, like seats, handlebars, and rack. More good rollin' times await.